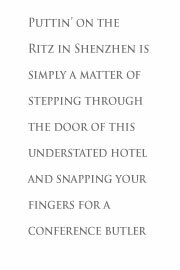 UST an arm’s length from the neon glow of Hong Kong, and easily accessible by rail, The Ritz-Carlton, Shenzhen is a modern icon that has put its unmistakable stamp on the fast-developing business enclave of Futian, but not on account of any exterior bravado. This is not a muscle hotel with preening pout. It is quite the opposite – elegant, unobtrusive, a splendid refuge for corporates in search of a meeting getaway, executive road warriors, or leisure trippers seeking to combine style with shopping. This 282-room address is gaining a name as one of the best Shenzhen business hotels with 1,319sq m of conferencing space including a spacious ballroom, hi-tech frills, and handy conference butlers. Head up from the discreet wood-panelled lobby to rooms featuring cool timber parquet underfoot, flatscreen TVs, DVD players with surround sound, WiFi, high-speed Internet, iPod docks, marble baths, rain showers, toiletries to make Cleopatra swoon and, finally, the in-bed indulgence of 400 to 800 thread count linen. Deluxe rooms with invitingly plump beds and cream-gold runners start at a briefcase-swinging 50sq m while the 43 suites, with grand views of the city (and even some outdoor balconies) offer 104sq m of stretch-space. The Ritz-Carlton Suite tops it all with 446sq m of refined elegance fusing classic wooden furniture with contemporary décor, bright carpets and, everywhere, those floor-to-ceiling windows that are so welcoming of light. 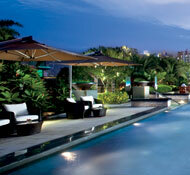 The Ritz-Carlton Club floor further personalises service with the added lure of a well-stocked Club Lounge. For distraction, or a slow unwind, guests can enjoy the spa, a beauty salon, a fitness centre, or the alfresco rooftop pool. And for those not counting calories, there’s a broad range of world-class restaurants including the opulent Xingli for Cantonese and spicy Szechuan, Paletto for zesty Italian, Flavorz for all day munches, and Fix, the aromatic deli. 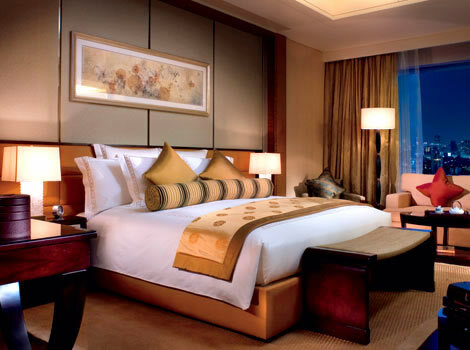 Executives, like armies, march on their bellies, to quote Napoleon, and this address has cooked it just right as one of the best Shenzhen business hotels.